I headed out for my first post-Philly run on Wednesday, a nice and easy 3-miler that I only knew the distance of from memory. I left my Garmin at home, didn’t wear a watch, and have no idea what my pace was. I burst into tears within the first few steps (I’m such a weirdo) but fortunately I was alone and it was dark out. It felt really good to be out there. We headed to my in-laws’ for the long weekend Wednesday night, and Thursday morning I got in a nice 4-miler before I gorged on all things Thanksgiving. Friday morning I headed to the gym and ran into a trainer I know who happens to be one hell of a talented/hardworking Ironman. We chatted about his recent PR in Arizona, and my recent, um, disaster in Philly. It was nice to hear from someone as accomplished as he is (a 3:14 marathon split in his last IM…wow) that he’s had those races too. 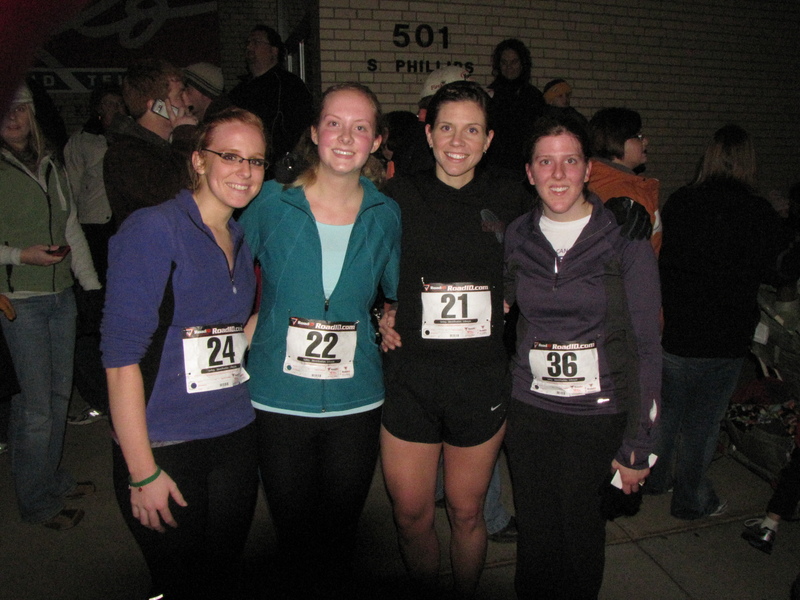 Friday night I ran the Jingle Bell 5k with my sister-in-law, her best friend, and my best friend from high school. None of them had ever done a race before, and were fortunately all good sports when I urged them to sign up a while back. Megan (sister-in-law) and Liz (her best friend) had been following Higdon’s 5k program, so they were ready to tackle a sub-30 goal. Alishia (my friend) hadn’t really been training and said she was up for whatever. The race was an absolute blast. 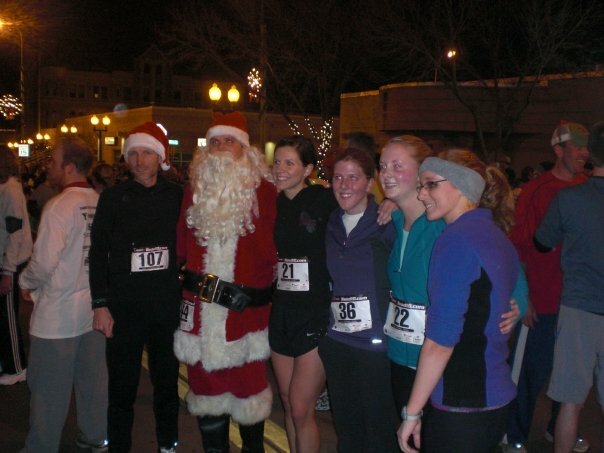 My training buddy Jeff dressed as Santa, and we were right behind him for the first mile and got to hear EVERY kid jump up and scream “Run Santa!” I think I had a permagrin on my face. The turnaround was in Falls Park, which is totally decked out for Christmas now and looks gorgeous. Jeff and I are planning a night-time run through there this week when it’s all lit up again. On the way back, Alishia started to drop back a little, and by the time we were a few blocks from the finish she started to walk, and motioned at me like I should just go. I ran back and jumped behind her, got on her heels, and told her every motivating thing I could think of. She hasn’t been running much, so she was definitely hurting. Megan and Liz were trucking along and I told her to go catch them, and she went for it–we all finished within a couple seconds of each other. Helping your friend cross her first finish line=soul food for a slightly heart-broken marathoner. 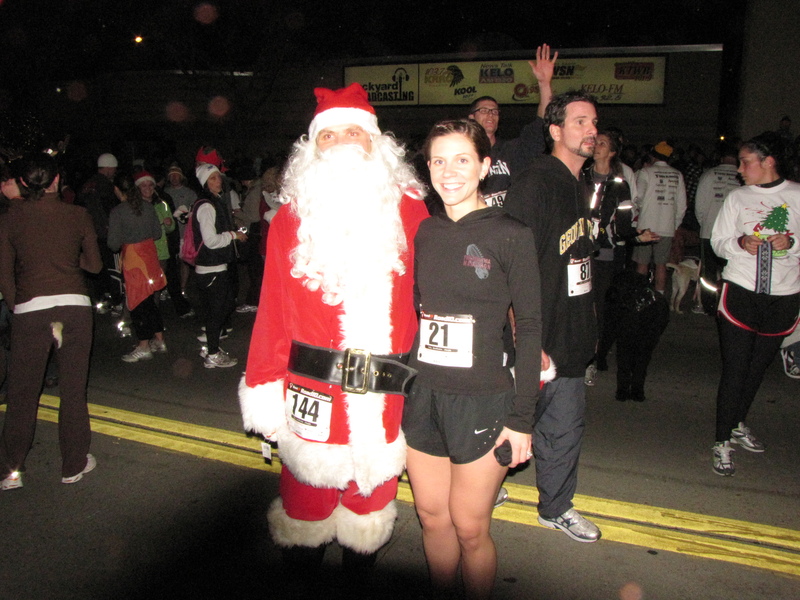 Me and my training buddy, Mr. Claus. I’ll definitely do this one next year–and hopefully race it! One thing is for sure, I DEFINITELY need more festive attire for next year! Today I’m messing with my 2010 race schedule. So far I’ve settled on this race series, which includes a New Years’ Day 10k, a June half marathon, an August duathlon (run 5k, bike 18 miles, run another 5k), and an October half marathon or 10-miler–haven’t picked my race for the last one yet. It’s a long way out to commit to all of that, but you have to by the end of the year to do the whole series, and prices start going up December 7th, so it was time to decide. Other races I’m considering: the Fargo Marathon (May), the Chicago Marathon (October), the Sioux Falls Half Marathon (September), the Leading Ladies’ Half Marathon (August) and a slew of other 5ks and 10ks. Obviously I won’t do them all…these are just the ones I’m looking at right now. So far the only marathon I’ve really set my heart on is Chicago…but we’ll see. Have you registered for any 2010 races yet? Got any suggestions/recommendations as I’m making my calendar? I’d love to hear them! Hope you had a wonderful holiday weekend. Happy running. Can’t wait to tackle that Monster Series this year! Megan, you are gorgeous, love the pitucres, and love the bi-lines, great photography. You and Paul seem made for each other!P.S. The photographer is not bad looking either!wishing you all the happiness.